Bangkok, Thailand -- The Buddha, in his laughing incarnation, is often depicted with a jolly smile and a giant, quivering belly. That model of plenitude seems ever more apt in Thailand, where the waistlines of the country’s Buddhist monks have expanded so much that health officials have issued a nationwide warning. 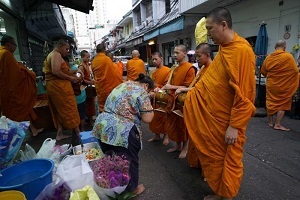 In June, officials from Thailand’s Public Health Department urged laypeople to offer healthier alms to monks, who set out from temples in their saffron robes each morning to roam the streets collecting their meals in the Buddhist tradition. Amporn Bejapolpitak, the department’s deputy director general, also suggested that the monks add more physical activity - like cleaning their temples - to their sedentary lives of prayer and meditation. Obesity has reached alarming levels in Thailand, which ranks as the second-heaviest nation in Asia, after Malaysia. One in three Thai men are obese, while more than 40% of women are significantly overweight, according to Thailand’s national health examination survey. Monks are at the forefront of the problem. Nearly half are obese, according to a study conducted by Chulalongkorn University. More than 40% have high cholesterol, nearly 25% have high blood pressure and one in 10 are diabetic, the study found. One major culprit? “Sugary drinks,” Ms. Jongjit said. Monks are forbidden to eat after midday, so to keep their energy up, many rely on highly sweetened beverages, including energy drinks. Thai Buddhist devotees believe that offering alms secures them good karma in this life and the next. “Soft drinks, boxed juice, sweet snacks; plus many of the foods are store-bought, which means they are packed with MSG and are low in protein and fiber,” Ms. Jongjit said, listing a litany of unhealthy food items that monks regularly receive. Some people still do things the old way. Vilawan Lim, a homemaker in Bangkok, has been offering monks home-cooked food every morning for more than a decade. As a matter of principle, monks are not supposed to show preferences for particular foods, but she said the monk who comes by her home each morning drops hints about what he really enjoys. Working with the Thai government and religious authorities, Ms. Jongjit manages the Healthy Monk-Healthy Nutrition Project. Funded by the Thai Health Promotion Foundation, an autonomous government agency, its goal is to improve monks’ lifestyles through education about nutrition and physical fitness. Its pilot program in 2016 involved 82 monks at temples and a monastic college, and its results were positive, with weight loss and lowered cholesterol levels recorded. Now, the project publishes recipe booklets that Buddhist devotees can use to make healthy and inexpensive meals for monks. The project encourages monks to keep a log of their daily physical activities. Monks told researchers that they often did not realise they were putting on weight because of their loose-fitting robes. Ms. Jongjit and her team came up with a belt with knots to indicate where they thought a healthy waistline should be.